I've been insanely busy the past while so it took some time to finish up my newest kit. I had the pleasure and honour of collaborating with Re Kneipp of The Hidden Heart. I can't get over how talented, skilled, and productive he is at such a young age. We designed an art themed kit all about creativity and inspiration. I hope it will inspire you as well. For the next few days it is 20% off in my shop. It will debut in Re's shop on Thursday. Let me start off by saying that I love balmy breezy days. Add a little humidity to my day and my mood is sure to be just that much more serene. Today's balminess reminded me of rainy season in Japan. I kept waiting for the rain to fall but so far it hasn't. The kids and I headed off to the park with our new Easter kites in hand. I didn't take my camera because I know how easy it can be to get caught up in capturing an event rather than just living in the moment and enjoying it. However, halfway to the park I knew I'd missed a lovely photo opportunity. 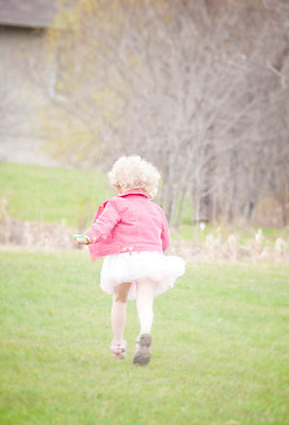 The light was perfect and Lauren was exceptionally cute in her pink tutu and pink corduroy jacket. To me, kites have always been fun but difficult to maneuver. I didn't have high hopes for our success. I was SO wrong! Lauren had her kite flying in seconds. She ran up the hill and then ran back into the middle of the field. I helped Nyal get his flying and he did it! I was amazed but not as much as he was. He was so overflowing with Joy. Jumping for joy! All the while I was thinking "oh, WHY didn't I bring my camera and video camera? Why oh why?" and then tried to just soak it all in anyway. After quite a while, I told them we'd go home and get the cameras and come back for more kite flying. They agreed. Yay! Well, it is my belief that some moments just aren't meant to be captured. We returned to the park. The wind had died down a bit so Lauren was having trouble getting a lift for her kite. While I helped Nyal he decided he wasn't really into kite flying anymore. Then I got both their kites up in the air as they landed into a pine tree. I managed to free both kites. I started to take a few photos just as my battery died. So I took some quick video as the wind died down. Mostly I filmed Lauren trying to detangle the string wrapped around her legs. Nyal found the sand toys in the wagon and ventured towards the play equipment surrounded by sand. So, we built a castle and came home for some lunch. I hope I remember this morning always. Lately I have had so much on my mind, so much I want to say and yet I just don't have time to sit down and write it out. Who does, right? Yet sometimes getting it all helps you sort through the chaos. My life has been so busy I haven't been able to.... finish this sentence, apparently. This screen has been left open for over 24 hours. Guess I didn't get back to it. I wonder what the planned ending to the sentence was going to be. I've long forgotten. I've been a bit overwhelmed the past few days as I try to organize my life. The best thing I've done in the past two days is to go in our backyard. My daughter could hunt for worms to her heart's delight and my son could put 100% of his concentration into the sand table while I raked, and trimmed, and pulled out tree stumps with my bare hands. Ok, I was wearing gloves. Being outside and accomplishing a task felt so good. My kids were happily occupied, my mind was free to think, my body was getting exercise, and things were getting done. Yesterday afternoon (when I originally started this post) I was organizing my closet, my kid's rooms, and my craft room. I needed to prepare my son's room for his big boy bed. So, one small task turned into several larger tasks. My son loved his bed and slept soundly while I sat in the next room weeping over the passing of time and my babies no longer being babies. Ok, I wasn't weeping but I have been nostalgic. How quickly things change! It seems strange to me that I don't need a crib in the house. I waited so long to have babies and now suddenly I'm past that stage? So, while the kids were happily playing in my daughter's room, I was organizing, keeping, purging, and sorting through boxes of stuff I've collected over the years. I'm sticking the usuable pieces of ephemera into my Project Life page protectors to use at a later date. I came across a stack of 12x12 scrapbook paper. Very exciting to sort through... my version of being in a candy store. I've felt so guilty these past three years knowing I have all this wonderful paper product and no project for it. I found this one paper that has 12 journal cards on one page. I didn't think I had anything like that since most of my supplies predate Project Life. When I was admiring/drooling over the paper I was delighted to see it was designed by none other than Nancie Rowe Janitz! You all know how much I like to blog about her (sometimes on my other blog: tappingthedreamtree.blogspot.com). The paper is called Delight Cards from her Delight line at Fancy Pants Designs. It is from 2009. So, I was excited before to find something so pretty to use in my Project Life but now it has even more significance. Thinking about the events happening in my life right now has caused me to reflect on how I got here. I've been paper scrapbooking since 2000. I wanted to make my sister an engagement album. 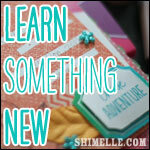 Then I started up my own online scrapbook store. I didn't have the time, energy, or know-how to keep it going. I didn't have a huge amount of my own supplies as money wasn't exactly flowing in my lean years. I mostly drooled over what I saw in stores or in magazines. In 2006 I got married and was able to buy supplies and actually dedicate time to crafting. It was also that year that I made my first digital pages. I wasn't totally sold on going digital as I liked to work with my hands, I spent all day at a computer and had no desire to spend my nights there too, and I liked the tactile finished project. Then I had babies. 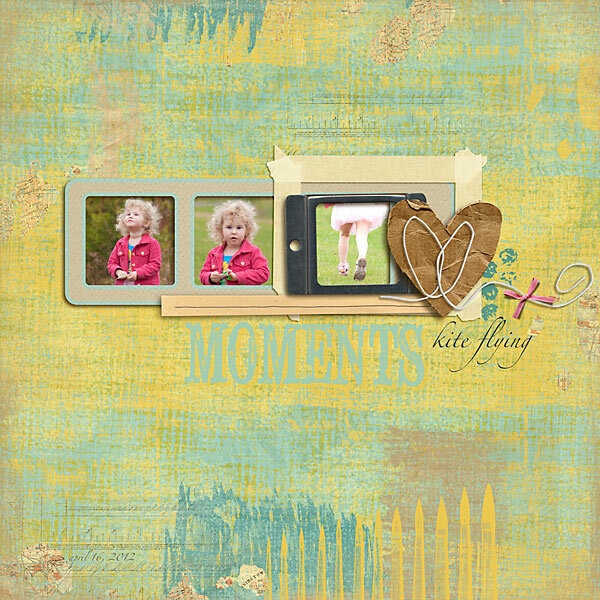 When my daughter was around 6 months old I began making layouts again. Everything took so long and I was worried about her getting into the supplies. 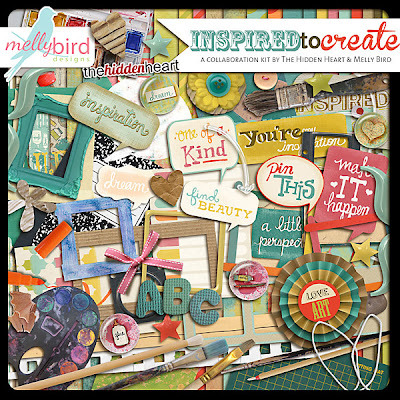 I treated myself to an online course (25 days of templates I think it was called... by Tiffany Tillman at ReneePearson.com). I had planned to use her templates to make paper pages but somehow the whole "going digital" thing clicked in and there was no going back. I spent the whole next year trying to master digital scrapbooking. Tiffany's courses really gave me the education I needed. Then I joined a couple creative teams. The whole time I knew I'd want to design my own products too. 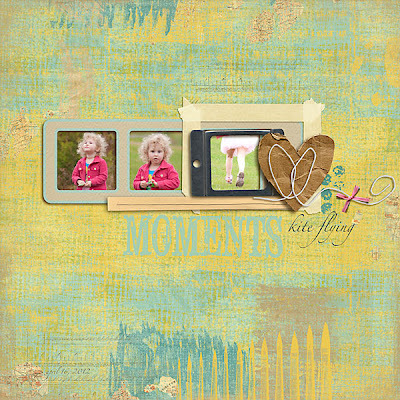 I was thrilled to find my passion in digital scrapbooking. I could create so many layouts in much less time and with no mess to clean up. I liked the end result. I was pleased to see that using quality digital supplies and learning techniques like shadowing made for beautifully printed pages (which I print at Persnickety Prints, by the way). I loved that I was quickly building my collection of memories. Photos were getting used, journaling was getting written down, and revisions could easily be made. And yet, I felt so guilty. All my beautiful stash of paper products were sitting in drawers and bins just itching to be used. "use me, use me" they whispered to me when I entered my craft room. "Someday, someday" I'd sigh. Then, a bit late to the game, I discovered Project Life by Becky Higgins. Oh, the beauty of page protectors. I LOVE this concept. One thing I didn't like about digital is that I can't add my ephemera to a page. Sure, I can scan it in and sometimes that is enough. Other times I just really want to add that drawing or ticket stub. Or I just want a little event to be documented without making it the focal point of an entire page. So, I bought page protectors. As pretty as the complete collection of journal cards (and all that is included in her kits) are I don't need them. I WANT to use up my stash of existing supplies. The mere thought of using up my supplies thrills me. I plan to use Project Life in three ways... I think. 1. I plan to do all my travel albums in this way. I have bins of ephemera and little notes, and photos about trips I've taken. All just waiting to be scrapbooked. 2. My actual present life. That will be done in the way that most people consider to be Project Life. 3. Past stuff as I find the time. I've been sorting through boxes of stuff I've saved over the years. Most of it can be thrown out. The rest I hope to use in my album. So, I THINK I've found my scrapbooking style. The style that will allow me to effectively keep memories. My style is 1. Project Life, and 2. Digital. Sometimes I will still need to make a full 12x12 layout. 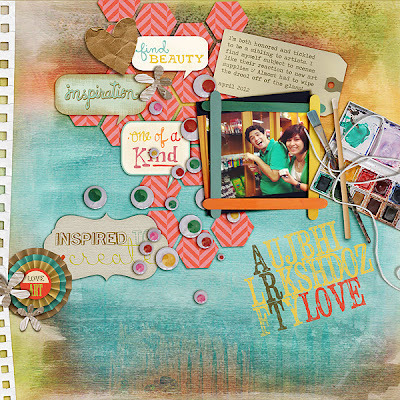 Whether it is just a creative desire, or a matter of composition, I know I'll still scrapbook digitally. The rest of the time, I'll use my project life method. I realize there are lots of digital versions of Project Life. I might use them a bit but the main point of my using PL is to use real life stuff, so there isn't a whole lot of reason for me to do it digitally. However, I do plan to use the computer to make my own journal cards, or other designer's versions, or to print out journaling. And of course to edit my photos. I've yet to actually finish a Project Life page. I'm working on it... I will find the time. Just not yet. So, I am fascinated right now by my coming full circle from paper, to digital, and back to paper. If I hadn't made that choice to sign up for Tiffany's class I would not have had the experiences, and met the friends, and made the connections to bring me where my life is now leading. 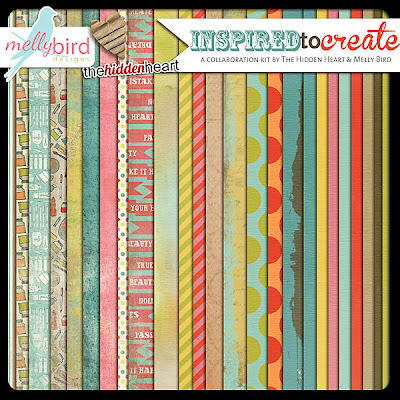 In going digital, I joined creative teams, learned new skills, became a digital designer, and am now embarking on the dream I had when I first started paper scrapbooking. I'll tell you about the fulfillment of that dream in a couple of weeks.